Reading With Monie: Another one down!! 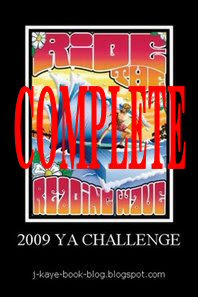 My YA Challenge is complete. It seems like I've stalled on my challenges so it's a relief to knock this one out. It gives me a littre more time to concentrate on completing my 999 challenge by the 9/9/09 bonus date. I still have quite a few young adult books in my review TBR pile so I'll continue with this list through 2009. Whoo hoo!! Congrats on finishing in a timely manner. Doesn't it feel good to have it completed? Have a good week and happy reading. It sure is nice to be able to mark a challenge off your list, isn"t it? Congrats! I've only finished one so far, the first in a series challenge. I hope to get this one marked off too, but it won't be for awhile yet! Way to go!